Where did Holden Caulfield come from? Michael Moats finds out. Roger Lathbury writes about how he almost got to publish J. D. Salinger's Hapworth. Here's a link to the novella in question. And here's Michiko Kakatani's review of Hapworth. In J. D. Salinger's magnificent story, "Uncle Wiggly in Connecticut," Mary Jane wants to know why Eloise married Lew if he's so unintelligent. "Oh, God, I don't know. He told me he loved Jane Austen. He told me books meant a lot to him. That's exactly what he said. I found out after we were married that he hadn't even read one of her books. You know who his favorite author is?" "L. Manning Vines. Ever hear of him?" "Neither did I. Neither did anyone else. He wrote a book about four men that starved to death in Alaska. Lew doesn't remember the name of it, but it's the most beautifully written book he's ever read. Christ! He isn't even honest enough to come right out and say he liked it because it was about four guys that starved to death in an igloo or something. He has to say it was beautifully written." Mr. Vines is apparently imaginary and his book would have found its way into The Invisible Library if only Lew had remembered the title. "Uncle Wiggly" is the only Salinger story adapted for the movies. Susan Hayward played Eloise, Lois Wheeler, Mary Jane. Dana Andrews plays the misnamed Walt Dreiser, Eloise's lighthearted young love, who dies absurdly in the war. I'm guessing that Salinger had another Walt in mind. Walt Glass. Hayward was nominated for Best Actress. She lost out to Olivia de Havilland. L. Manning Vines probably didn't make it to the film because the writers made Eloise a single mom. No Lew. 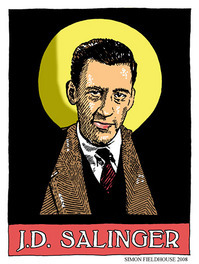 This may help to explain why Mr. Salinger shied away from the movie industry. With sister Doris in Miami Beach. Here's a valuable web site for obsessive Salinger fans which includes uncollected stories and discussions of unpublished stories.